It has been about 17 years since we dined at the Boathouse. We have been several times over the years to their rooftop bar and enjoyed their bar menu and drinks, with the amazing view of the marsh and the ocean. You can see the Ravenel Bridge in the distance and often times you will see a pod of dolphins playing or feeding. 17 years ago we went with our son and his, then, girlfriend. She was visiting him and he wanted to take her someplace special. There were few fine dining options other than downtown, and none with a view. We made reservations and ended up waiting 3 hours for our table. Management handled it poorly and we vowed never to eat there again. We decided it had been long enough, so we gave them another try. We made a reservation, arrived early and went to the dockside bar and had a lovely view and cocktail. Our table was ready on time but when we got to our table it was so crowded that Mike, at 6’4, and the larger man seated behind me, would have been terribly uncomfortable if we tried sitting. The view was of the parking lot. I don’t think it is worthwhile to squeeze in those extra tables and chairs at the price of your customer’s comfort, especially if someone has taken the time to make a reservation. We walked away and went back to the bar, took our same seats and ate there with a lovely view, plenty of room and a very nice bartender. The hostess couldn’t have cared less that we were not satisfied with our table, so it appears that some things never change! The food was good and the portion was a nice size. 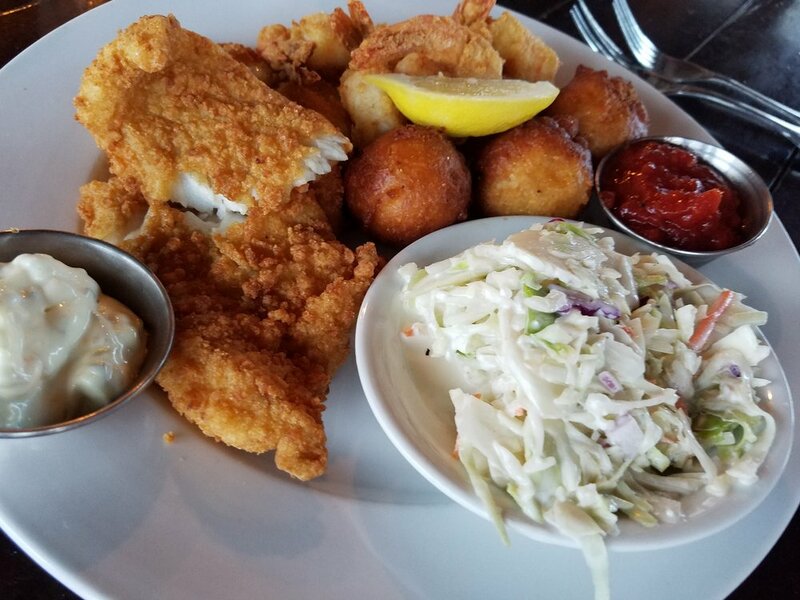 Mike had the fried scallops, flounder and shrimp. They claimed they were East Coast shrimp, so I am not sure if they use local or not. The batter was light and good. It came with blue cheese coleslaw, which was light on the blue cheese - we didn’t taste any but that doesn’t mean it wasn’t in there. The hushpuppies were excellent. We had had them before when visiting the bar. We ordered a side of Old Bay fries, not because we needed them but because they sounded so good. Both of us were disappointed, as it was difficult to taste the seasoning. 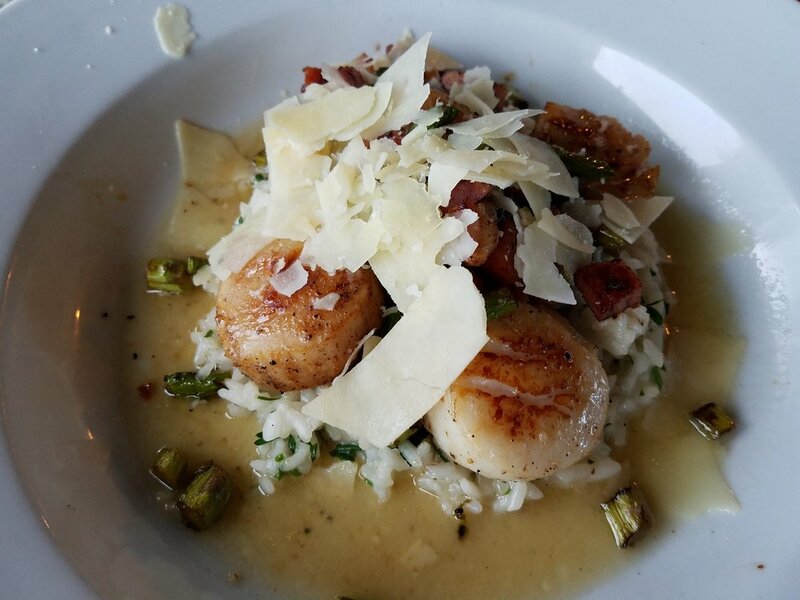 I had the pan seared scallops over risotto with parmesan cheese, prosciutto, and asparagus. It was a nice size and was good, but again, nothing that really stood out. It seemed to us that the menu had not really changed since they first opened about 20 years ago and with so many wonderful restaurants, not only Charleston but Mt Pleasant and the islands, we will stick to having cocktails and apps with the lovely view.